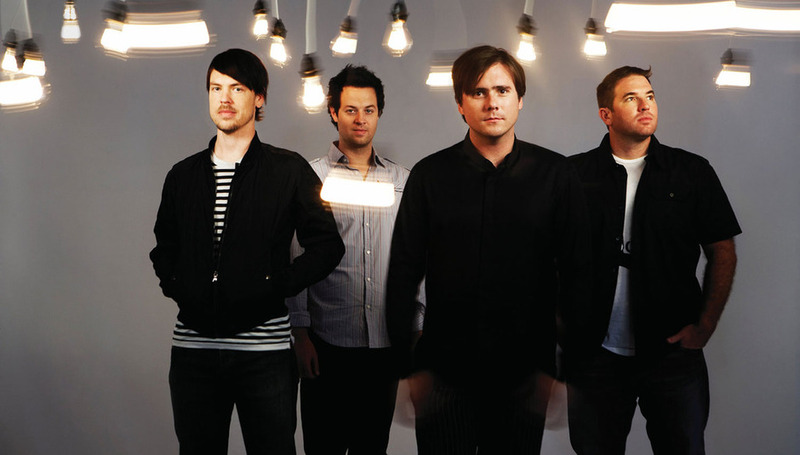 Jimmy Eat World’s last album, Chase This Light, might not have been brilliantly received by DiS, but we’ve our share of old-school fans nonetheless, and it seems a good few readers have a soft spot for the Arizona four-piece – when we asked for your reader questions the response was impressive. …And before you ask, no, I didn’t have time to ask if they got “mega stonk-ons while recording the video for ‘The Middle’”. Sorry. From user Heartbrokenstar: what’s the back story to playing two sets at Reading Festival last year? Jim: They asked us to play two sets, and we said we’d do it. Tom: It was kinda fun though – when we played the second stage we got to play more. I think when we were on the main stage the set was cut down a bit. J: It was kind of like playing a full show, when the two were put together. It was a lot of fun. T: From a band’s perspective, though, you have to keep things short. I’m assuming a lot of festivals look the same to bands – similar back stage areas, et cetera. J: Yeah. But I’ll usually walk around at a festival, if it’s a decent one. Reading and Leeds are always good. A related question, then – have you any festivals lined up for this year? J: I know we’re playing Download. That’s predominantly metal. Are you going to fit in? T: We’re the experiment band, then. Or we’ll have to play all our metal stuff. Another question here, or rather more of an instruction, from user JAMESM: I’m sure you’d be welcomed back at Reading as Radio 1 tent headliners, just don’t play frigging V Festival… Any plans to play that? T: Maybe James got his tent raided at V, and got all his weed stolen or something. Clearly he’s got some sort of vendetta against V.
Maybe, maybe. V has a bit of a dad-rock reputation here, though. Do you have it in the States yet? I know it’s been to Canada. T: It is in other countries for sure. Australia? I think it might’ve been there, too. Okay, moving on, with a question from Alex-in-Ciderland: how did you respond when Capitol Records tried to re-sign you after they’d heard Bleed American? J: It was funny. I mean, I really would have loved to have that meeting with them – like, what could they have said? We basically responded by saying that we’d take a meeting with them, but they’d have to give us back our masters. So nothing ever happened. So they retained the property of your older records? Seems those sort of deals are changing slightly nowadays, with bands often more in control of their recordings. J: Yes, certainly it’s getting towards being an exciting time to be a band. You have more options now than before. The power’s more with bands now, rather than those invisible sorts at major labels? J: It depends entirely on what sort of band you are, and what your record sounds like. There’s definitely a place for the big label infrastructure and everything it can do. But that might not be the right thing for some bands, y’know. Have you seen any peers, or friends, chewed up and spat out by the machine, that maybe got in with a major when they’d have been better off sticking to an indie label? T: There was a time when a lot of bands, like Jawbox and Jawbreaker, got signed and they put one record out and that was it. Rocket From The Crypt, too. J: I don’t know how much of that is down to the label though and how much comes down to internal band decisions. Just getting a record deal isn’t going to solve anyone’s problems. I guess if you’re top dog at an indie, switching to a major could find you becoming the fourth or fifth priority for a PR guy, or worse. J: Oh of course. If you’re on an independent label and the people behind the label are really excited about your record, then that’s a much better position to be in than if you’re a small fish in a big major label. Less a pond, more an ocean. Semi-related, another reader question from stabby3: as a band with a number of labels in your career, what do you think Radiohead’s move to release In Rainbows for free means for the industry? Would you ever consider doing it? J: Um, well of course we’re thinking about all options of how to release material. I’m not so sure that the ‘tips jar’ method is going to be the model for distribution in the future, but I also don’t think… Well, I don’t know… it’s a complicated question y’know? Fortunately we don’t really have to deal with it right away – everything changes so quickly. But I do think it’s great. It’s interesting that Radiohead still had to go down the traditional route – signing to a label and putting out a proper CD – eventually. And, also, it’s worth noting they’re a huge band, and were assured a certain revenue from the online venture. Well, I don’t know about cassettes… I can’t remember the last time I saw one in HMV. J: (Laughs) Yep. But the physical album isn’t dead. The collectors, these people want to have the record – it’s more meaningful. T: Taking that to its extreme, the CD is worthless. An LP is valuable, y’know what I mean? People who want a piece of a band, or an album – I see them buying an LP over a CD. Well I know very few people are buying CD singles right now – something like 80 per cent of UK singles sales are now digital. J: I understand that. I mean, I’ll buy a CD, but then I’ll put it in my computer and put the CD in a little box. I don’t listen to CDs. I have my vinyl at home, but that’s different. Speaking about albums, there’s a question here about your artwork from Kayleia: what is on the front cover of Static Prevails, and what’s the inspiration behind your album covers, particularly Futures? J: Static Prevails _is a rooftop in Denver, and those are chimneys. T: It’s just turned on its side. So it’s actually very simple. J: Yep. The Futures album cover is taken from the Burning Man Festival. There’s a phone booth in the middle of nowhere with a sign above it that says ‘Talk To God’, and if you pick it up there’s actually someone you can talk to. But this phone is in the middle of nowhere. It’s crazy. Best find something good then. Rate the Heatmiser albums in order of greatness? No. Okay, here’s a broad one from Jolley: how does it feel knowing that your songs have been listened to literally millions of times? He says that there’s been over 20 million listens on last.fm alone. J: It is amazing, and exciting what technology can do these days. Actually, I don’t sit around too much thinking about the millions of people out there who are listening to us or not – it’s one of those things that could drive you crazy if you let it get to you. Crazy in a good way though? J: Yeah, I think that it’s nice. It’s way better than nobody caring! The album Chase This Light and the single ‘Always Be’ are available now via Interscope. More at MySpace here. Did we use one of your questions? If so, post below.